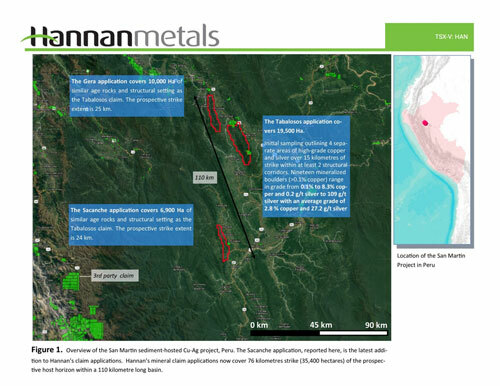 Vancouver, Canada – Hannan Metals Limited ("Hannan" or the "Company") (TSXV: HAN) (OTCPK: HANNF) is pleased to announce it has further expanded the area under mineral claim application at the San Martin sediment-hosted copper-silver project in north-central Peru. A district-scale sediment-hosted copper terrane is now secured, with applications covering more than 76 kilometres strike of the prospective host horizon. Sacanche delivers an additional 25 kilometres of host horizon strike under application, and is interpreted to be an extension of the mineralized position discovered in Hannan's Tabalosos claim applications where initial sampling by Hannan outlined four areas of high-grade copper and silver over 15 kilometres of strike within at least two structural corridors. Nineteen grab samples from mineralized float in river beds (>0.1% copper) ranged in grade from 0.1% to 8.3% copper and 0.2 g/t silver to 109 g/t silver with an average grade of 2.8% copper and 27.2 g/t silver. Historic prospecting at Sacanche identified both sediment-hosted copper and lead-zinc showings with multiple gossans up 80 metres in thickness with anomalous zinc, lead and copper and grab samples from creeks assaying significant copper and silver within the 25 kilometre strike of the claim application area (Figure 2). Michael Hudson, Chairman and CEO states, "San Martin demonstrates the initial makings of a high-grade sediment-hosted copper and silver discovery in north-central Peru. Hannan's first mover position has allowed claiming of a district-scale sedimentary copper-silver target over 76 strike kilometres in length and we look forward to a multi-team exploration program during 2019 to target areas of grade and thickness." Hannan's claim applications extend over a combined 76 kilometres of strike within a 110 kilometre basin scale trend. Early stage historic exploration at Sacanche identified both sediment-hosted copper and lead-zinc showings. Multiple gossans up 80 metres in thickness with anomalous zinc, lead and copper have been recorded over multiple kilometre strike (Figure 2). The thick lead-zinc gossans are interpreted to be developed at different stratigraphic positions than the interpreted location of the stratabound sedimentary-hosted copper-silver mineralized target zone. 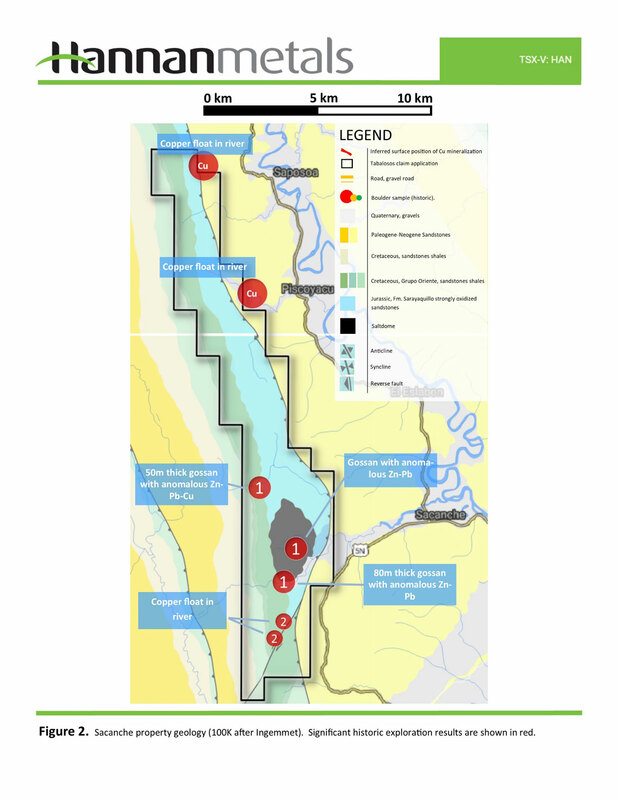 Scant historic sampling records grab samples from river float assaying significant copper and silver discovered intermittently along the 25 kilometre strike of the Sancache claim application area (Figure 2). Hannan interprets the separate copper and lead-zinc mineralized zones as products of an evolving basinal system, related to processes observed in other sedimentary-hosted copper districts where lead and zinc can be locally elevated. Hannan Metals Limited is a base metal project generation company. It has 100% ownership of the County Clare Zn-Pb-Ag project in Ireland, which consists of 9 prospecting licenses for 35,444 hectares and has recently filed mineral claim applications for 35,400 hectares within the San Martin Province in Peru searching for copper and silver.